Markelle Fultz, the first player taken in the 2017 NBA draft, had major shooting problems and missed most of his rookie season. He is working with an independent shooting coach and “doing great,” Philadelphia coach Brett Brown says. 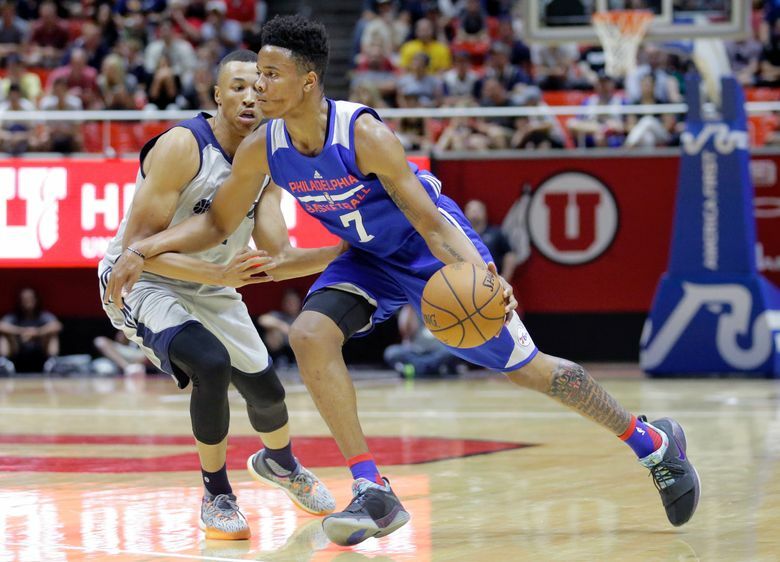 LAS VEGAS – Fans will get to see for themselves when videos of Markelle Fultz shooting a basketball surface, but the Philadelphia 76ers’ message is that the first player taken in the 2017 NBA draft is showing improvement. Brett Brown, Sixers coach and interim general manager, even said former Washington Huskies guard Fultz is “doing great” while spending the past five weeks working out with independent shooting coach Drew Hanlen in Southern California. Hanlen has confirmed what sources have told The Philadelphia Inquirer, that Fultz had the “yips” and “completely forgot how to shoot.” Several sources continue to say Fultz’s problems are mental. So for the most part, he has been doing “foundational-type” shooting drills. But Hanlen has said they are ahead of the pace they had set for the workouts. And Brown said Fultz, 20, is in a good place mentally. “He’s putting in work. That’s the first thing,” Brown said. “Then when I see him and I have other people see him, I have a gut feel that he feels good about himself. That he is confident. That he looks it when I’m with him. He feels and he looks confident. Fultz was limited to a combined 17 regular-season and playoff games this past season. He played in the first four regular-season games before being sidelined for the next 68 with what team officials called a right-shoulder injury. • The Oklahoma City Thunder gave forward Carmelo Anthony, 34, permission for recent meetings with prospective teams, including the Houston Rockets and Miami Heat, sources told ESPN. • Michele Roberts was unanimously re-elected to a second four-year term as executive director of the National Basketball Players Association. • Retired player Kermit Washington has been sentenced to six years in federal prison for spending hundreds of thousands of dollars in charity donations on plastic surgery for his girlfriend, vacations and shopping sprees. The U.S. Attorney’s Office said in a news release the 66-year-old Las Vegas man was also ordered to pay about $970,000 in restitution after pleading guilty in November to making a false statement in a tax return and aggravated identity theft. Washington is best known for throwing a punch that detached some of the bone structure of Houston forward Rudy Tomjanovich’s face from his skull and knocked him out during a 1977 game. Washington was playing for the Los Angeles Lakers at the time. Washington’s charity, The Sixth Man Foundation, did business as Project Contact Africa. Donors were told the charity was supporting work in Africa, including a medical clinic for needy families and HIV-positive children.